Luxury apartment, high class building in a completely new building just finished with an ample terrace/balcony of 13 sq. meters. West oriented. Living room with float floor that looks to the private terrace/balcony. Big sofa for three leather upholstered. Ample table with four chairs. Complete kitchen. 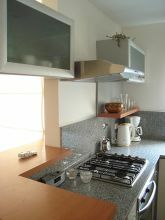 The kitchen is a full kitchen although integrated to the living room. With a modern design.Electric heater. Split Air conditioned.TV Cable. Internet. Separated bedroom with a double bed. The bedroom looks to the private terrace/balcony, as the living room.So you can reach both from the balcony making thus, a double circulation. Ample storage place with mirror in doors. Complete bathroom with stone coated walls. Roca faucets. There is a barbecue in the upper floor and a sauna. Only 5 blocks from subway. Double bed can be made two twins. Building has "parrilla" (barbecue)in the upper floor(Only with appointment) and SAUNA. Maid service available with charge.